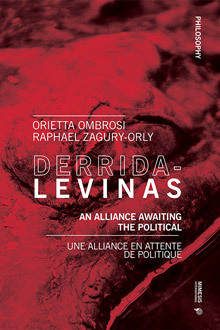 Drawing on the relationship between Derrida and Levinas and on the unresolved tension between their philosophical corpuses, this book aims to offer new possible interpretations on the future of democracy. What philosophical and political ideals can emerge from a parallel reading of these two acclaimed thinkers, and from their ‘philosophical alliance’? This volume attempts to re-imagine and to re-engage the realm of politics, by offering new perspectives on the multiple crises that traverse the contemporary age. Orietta Ombrosi teaches moral philosophy at Sapienza, University of Rome. She was a teacher and research fellow at the University of the Mediterranean, followed by the University of Bologna. She has edited collective books including, most recently, Ebraismo al femminile. Percorsi diversi di intellettuali ebree del Novecento (Florence, 2017). Among her monographs are L’umano ritrovato. Saggio su Emmanuel Levinas (Milan, 2010) and The Twilight of Reason. Benjamin, Adorno, Horkheimer and Levinas tested by the Catastrophe (Boston, 2012). Raphael Zagury-Orly is, since 2016, guest lecturer in philosophy at Sciences Po, Paris. In 2015-2016, he held a research position at the Karl Jaspers Zentrum, University of Heidelberg, and a guest professorship at Sapienza University of Rome. From 2004 to 2015, he was Assistant Professor of Philosophy at the Bezalel Academy of Fine Arts and Design (Jerusalem), where he also directed, from 2010 to 2014, the MFA program. He authored Questionner encore (Paris, 2011) and co-edited, with Joseph Cohen, Judeités. Questions pour Jacques Derrida (Paris, 2005) and Heidegger et “les juifs” (Paris, 2015).